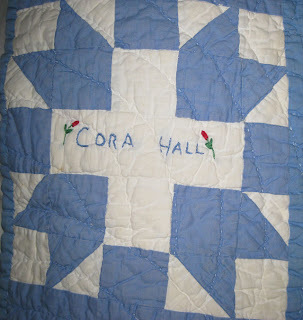 The Old Aurora Branch: The Signature Quilt: Cora Hall, "More Than a Friend"
The Signature Quilt: Cora Hall, "More Than a Friend"
Cora Hall’s long-time friendship with Myrtle Greer is attested in this note she wrote in Myrtle’s autograph book in 1933. Although it would be interesting to know more about the “cottage meeting”/birthday party, we can see at least that being a member of the Aurora Branch brought Cora friendship and good times. She appears in many early photos of the branch, and she is the center of this happy scene in 1932. L to r: Myrtle Greer, Mable Stemple, Cora Hall, Elder S. Lawrence Moss, Elder Walker, [2 unidentified children], Louise Greer, Jimmie Greer. Cora Hall had lived near Jim and Myrtle Greer in the small farming community of Tadpole, near Cypress, Illinois, in the mid-1920s. Jim often recounted working at the sawmill owned by Cora’s first husband, George Benard, because that was where he worked side-by-side with Oscar Johnson, who was a member of the Mormon Church. Jim watched to see if Johnson lived his religion and was impressed to see that he did. 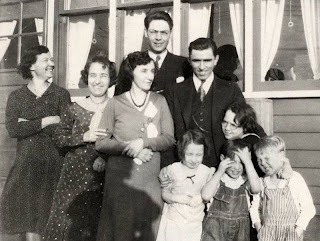 In 1927 George Benard was tragically killed in an explosion at his sawmill, leaving Cora with four small children and no insurance on his life or the mill. Within a year or so, Cora married Charlie Hall who lived in the area, but the marriage did not last. By 1930 she had moved to Anna, Illinois, as a personal companion and housekeeper to an elderly woman. Her children stayed in Cypress with their grandparents, Logan and Marietta Benard, who raised them. By October 1931 Cora was in Aurora. Eventually she found work as a cook and housekeeper for the Hollister family who lived at 564 Garfield Avenue. When first hired, she earned a dollar a day plus room and board. The Hollisters had a summer home in Wisconsin and, when they went there for two weeks every summer, Cora went along to take care of them. An active member of the Aurora Branch, Cora Hall attended regularly, paid her tithing, and, although much of the work was done by missionaries in those days, she fulfilled callings in the Sunday School and Mutual. Of course Cora Hall was among those friends who signed Myrtle’s quilt in 1948-49. 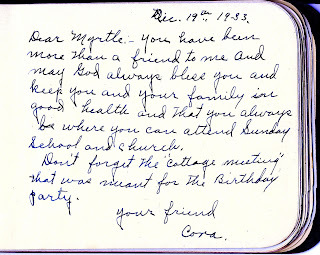 A couple of years later, the Aurora Branch newsletter noted that Cora Hall was ill and would love to receive cards and letters. Her son, who lived in Aurora, cared for her for a time, and then she went to live with a daughter in Batavia. She died of cancer in November 1951.